BLOODSTOCK are excited to announce four more additions to their August 2018 line-up. Get all the details right here! More metal that you can handle? Get up to speed with the latest additions for Bloodstock Open Air Festival 2018 right here. German metal legend, DORO will be our Friday night Sophie Lancaster stage headliner! With a career spanning over 30 years and 17 studio albums under her belt (including 4 with Warlock), DORO’s current label Nuclear Blast recently celebrated her 30 year anniversary with a 3 DVD box set, ‘Strong & Proud’; a great place to start if you’re not clued up on the Metal Queen. 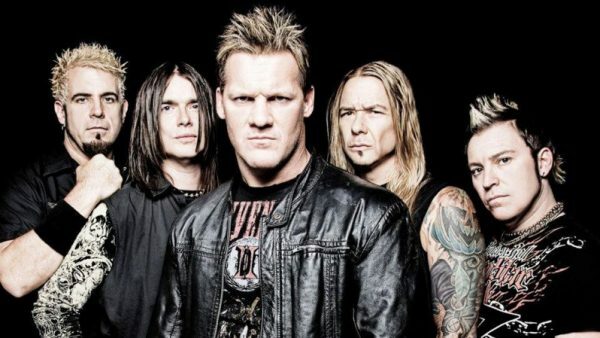 WWE wrestling star Chris Jericho’s band, FOZZY join Sunday’s Ronnie James Dio main stage line-up. 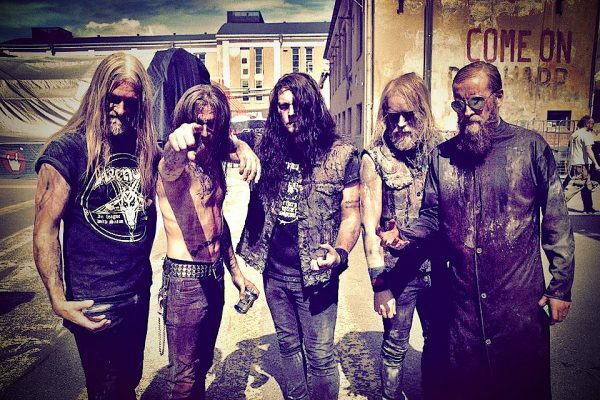 Currently rampaging across Europe, the Century Media outfit dropped their seventh album ‘Judas’ last month and have racked up more than 10 million views of the title track’s video. Check it out! Swedish death metal outfit, BLOODBATH will lay waste to the main stage on Friday. Guitarist Anders Nyström tells us “After eight years, our time has come to put the BLOOD back in BLOODSTOCK!” Not familiar with this supergroup featuring members of PARADISE LOST, KATATONIA and OPETH? Investigate their video for ‘Church of Vestitas’, taken from 2014’s ‘Grand Morbid Funeral’ opus and ready yourself for their long-awaited return! 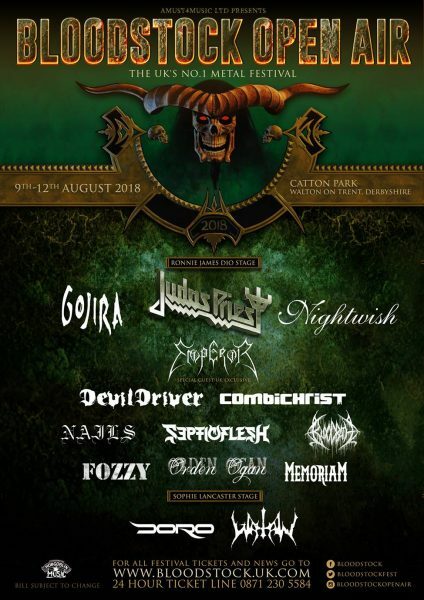 With Friday night headliners, JUDAS PRIEST, Saturday night headliners, GOJIRA and Sunday headliners, NIGHTWISH already announced, along with EMPEROR, DEVILDRIVER, WATAIN, COMBICHRIST, NAILS, ORDEN OGAN and MEMORIAM so far, 2018 is shaping up to be another stellar year for BLOODSTOCK. BLOODSTOCK’s first wave of Serpents Lair VIP tickets are now SOLD OUT! The final allocation, the last batch of VIP deluxe packages and a limited amount of VIP upgrades priced at £145 (for those who’ve already bought ‘early bird’ tickets) will become available at 9.00am on 16th December in the ticket store. Mark your calendars and don’t delay if you want to join us in 2018’s VIP Serpents Lair, as they’re moving faster than ever before! 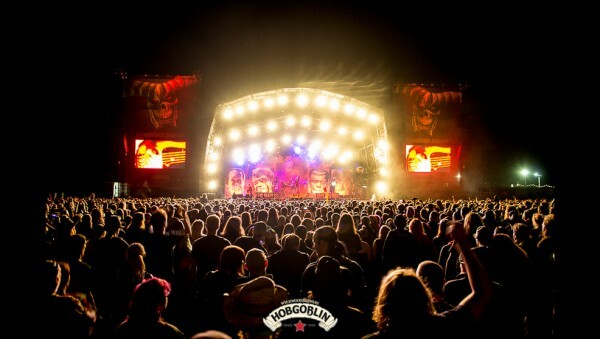 Weekend tickets are still available in very limited numbers at an ‘early bird’ price (just £125 for four days of metal fun) so grab yours now at the ticket store if you want to save £20! To keep up with inflation and increased costs in 2018, standard weekend tickets with camping will increase from last year’s £139 to £145 once the ‘early bird’ allocation sells out. Campervan pitches are also available now. If you already know you can only attend for a single day, sign up for a day ticket reminder email as day tickets do not go on sale until next summer. Register your day ticket interest here.